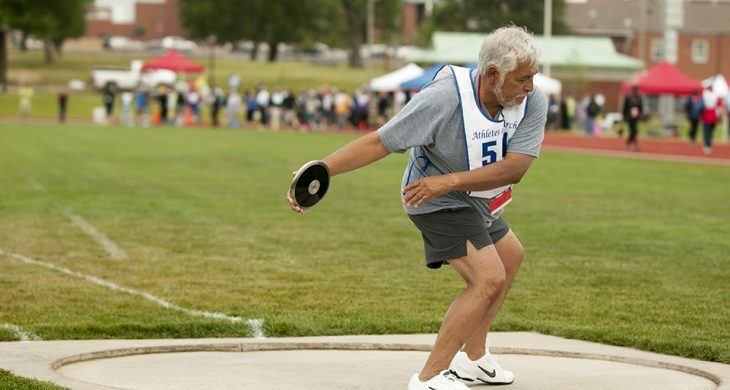 Celebrating its 29th year, the National Veterans Golden Age Games offer sports and recreational competitive events for Veterans 55 years of age and older. It is the largest sports and recreation competition for this age group of military Veterans in the world! The Games continue to serve as a showcase for the rehabilitation value that wellness and fitness provide in the lives of older Americans. The National Veterans Golden Age Games are an outgrowth of the historic involvement in geriatric programs by the Department of Veterans Affairs (VA). For many years, VA has put major emphasis on health and fitness with the goal of Veterans living healthier, longer lives. Many of the events began as recreational activities at VA hospitals and nursing home care units across the country. Inspired by the health and fitness movement for America’s senior citizens, the Games extend that concept to our nation’s aging Veterans. In 1985, the first National Veterans Golden Age Games took place in Albany, Georgia, with 115 competitors representing VA medical facilities across the United States. A “fountain of youth” for the rapidly aging Veteran population, the Games provide a multi-event sports and therapeutic recreation program for eligible Veterans receiving care at any VA medical facility. It is the premier senior adaptive rehabilitation program in the United States, and the only national seniors’ program designed to improve the quality of life for all older Veterans, including those with a wide range of abilities and disabilities. This event truly reflects VA’s mission – to provide quality programs and health care for America’s aging Veteran population. It has become one of the most progressive and adaptive rehabilitative senior sports programs in the United States and the world. Over the years, competitive events at the National Veterans Golden Age Games have been adapted to meet specific needs of the participants. The Games have separate age groups and gender divisions. Additionally, because many Veterans also face medical challenges, events were added for those who use wheelchairs and those who have visual impairments. To accommodate the varying degrees of physical conditioning, motor and cognitive skills of the participants, basic competition rules were adapted. The modification of rules and use of adaptive equipment in many events allow non-ambulatory and visually impaired Veterans to participate, in separate divisions where needed and with ambulatory and sighted Veterans when possible. This has made the National Veterans Golden Age Games a truly adaptive therapeutic sports competition that has become a model for other local, state and national senior sports events. Since 2004, the National Veterans Golden Age Games have been a qualifier for the National Senior Games, a member of the U.S. Olympic Committee. Through this partnership, gold, silver and bronze medalists in certain events have the opportunity to compete further, among America’s elite senior athletes. This outstanding program has grown from 115 participants its first year to more than 700 in 2010, making it the largest of VA’s six rehabilitation special events. For the past several years, the aging Vietnam Veteran population has entered the Games in greater numbers each year, making up the largest group of competitors by period of service. By age group, the over-70 age categories are now the largest. Since the Games began, Veterans have competed in cities across the United States. A listing of event locations and hosting VA medical facilities follows.